One of the most common issues dentists help patients with is dental anxiety. Are you apprehensive about visiting the dentist? Patients who suffer from dental phobia might delay seeing the dentist for years, forgoing their routine check-ups and other needed dental care. Neglecting regular dental care is taking a serious risk with your health. Cavities, gum disease, and other oral health issues may translate into serious complications. Without professional cleanings and other preventative treatments, your minor cavities and toothaches can quickly escalate into dangerous problems. Sarasota Dentistry helps patients take a hold of their oral health, using sedation to decrease anxiety and pain. Sedation dentistry provides you with control over your comfort by reducing dental anxiety and eliminating any sensation of pain during your treatment. Patients often come to us when their pain can no longer be ignored. If this sounds familiar, Sarasota Dentistry can help. At our office, your dentist, Dr. Hank Michael, is prepared to provide sedation for your dental treatment. Sedation dentistry is a measure used to calm patients’ nerves, ensuring treatment is comfortable and stress-free. Sarasota Dentistry offers intravenous (IV), oral sedation, and nitrous oxide Inhalation options for patients with dental anxiety, as well as those that require more extensive dental work. Regardless of your concerns or treatment goals, contact us today to find out how our sedation dentistry options can help you receive comfortable dental care. At the practice of Hank Michael, DMD, we do not believe a fear of visiting the dentist should stand in the way of the dental care you need and deserve. It is our goal to provide a positive experience, a comfortable environment, and exceptional treatment for our patients. Our sedation dentistry options can help smooth your way towards achieving and maintaining a healthy and beautiful smile. We’re here to help you stop avoiding dental visits and take control of your oral health, Get the dental care you deserve — ask about sedation dentistry at Sarasota Dentistry. Contact our friendly dental staff today and start learning more about sedation dentistry when you set up your first consultation. Who is qualified to provide conscious sedation? The State of Florida has strict laws requiring dentists to become certified in order to legally offer or perform moderate sedation in their dental offices. The certification training takes weeks to months to complete as well as a large investment in safety equipment. Moderate sedation permit holders have completed all of the training successfully as well as equipped their offices with all of the equipment necessary to perform sedation safely. A state inspector periodically visits these offices and inspects to make sure all the equipment is current and working. Sedation permit holders are also required to perform additional continuing education in the field of sedation dentistry every year. They must also keep a current BLS and ACLS certification. 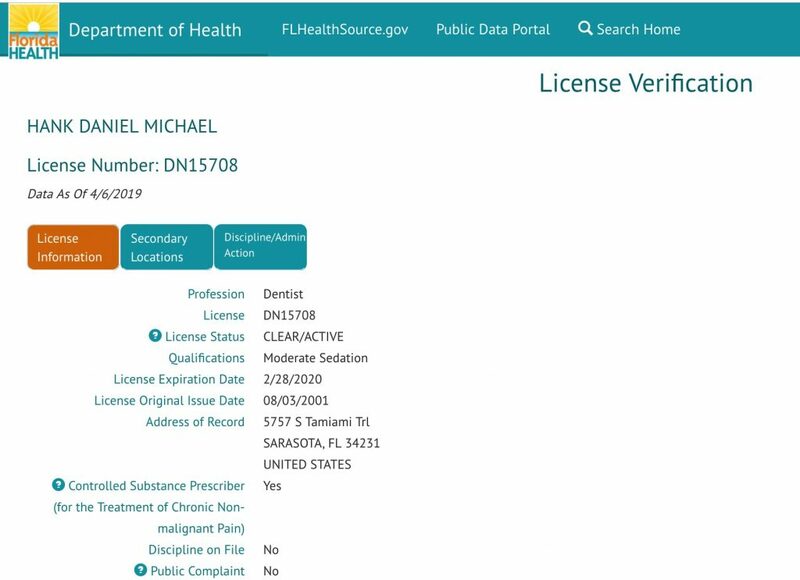 You can look your dentist up at https://appsmqa.doh.state.fl.us/MQASearchServices/HealthCareProviders to confirm they have a dental license as well as a moderate sedation permit. Sedation drugs are administered through an injection into the bloodstream, orally or through gas inhalation. Sedation is a good option for dental procedures that take time to complete, such as extractions, long cosmetic dental procedures and various oral surgeries. These drugs will diminish pain and provide relaxation. The cost for these drugs vary depending on which form of administration is used, the expertise of the provider and the area in which you live. IV is normally about $375 for the first 30 minutes and $125 for each additional 15 minutes as needed. Nitrous Oxide inhalation or “Laughing Gas” is about $70 per 30 minutes. Oral sedation is between $100-$200 plus the medication at the pharmacy. Deep sedation and general anesthesia are used for mouth or jaw surgical procedures that take a longer amount of time to complete. The patient is given these medications intravenously to put them into a deep sleep so they will be unaware of the surgery or any pain during the procedure. These drugs cost approximately $400 for the first thirty minutes and $150 for each additional 15 minutes as needed. Deep sedation is rarely necessary for dental work. In many cases, the cost of deep sedation or general anesthesia is completely or partially covered by the patient's dental insurance plan. Which patients benefit most from sedation dentistry? Dr. Hank is a sedation dentistry specialist with advanced training in dental anesthesiology. Patients who benefit most from sedation dentistry include those with serious dental fears, fear of needles or shots, sensitive gag reflexes, extremely sensitive teeth, significant pain during treatment, and anyone who may have suffered a previously traumatic dental experience. Patients who need extensive dental treatment (multiple tooth extractions, implant placement, bone grafting) are also excellent candidates for sedation dentistry. Importantly: If your fear of visiting the dentist stops you from getting treatment altogether, you are likely to be a perfect candidate for sedation dentistry. We will conduct an evaluation during your consultation to determine the best form of sedation therapy for you. For patients who are not good IV sedation candidates, we also offer oral sedation, which can similarly relax you using a pill-form medication or nitrous oxide sedation. IV sedation is delivered directly into a vein in the hand or arm, allowing patients to quickly and painlessly fall into a state of deep relaxation. Unlike general anesthesia, IV sedation does not put patients into a sleep-like state, but it does have amnesiac qualities, meaning patients will remember little to nothing of their visit. The effects of IV sedation usually take a few hours to wear off, so patients should plan on coming with a loved one to help them leave our office and get home safely. IV sedation is very fast-acting, allowing patients to feel relaxed within minutes of receiving it. Dr. Michael is licensed to administer IV sedation, so he can easily and safely make your time in the dentist's chair tranquil. Throughout your treatment, you will be closely monitored by Dr. Michael and a nurse, who will adjust the administration of the sedation as necessary. With our strict adherence to safety standards, you can rest assured our team is deeply committed to protecting your health. How is Oral Sedation dentistry different from IV Sedation? Oral sedation has many of the same effects as IV Sedation however, the time it takes to get these effects is less predictable and the effects may linger much longer. If a patient has serious anxiety, oral sedation may not be the appropriate option. Oral sedation is administered by the patient 1 hour prior to their dental appointment and they bring a second pill with them to the appointment where Dr. Michael evaluates them to see if they need the second pill. At times, adequate sedation is observed and other times the second pill and nitrous oxide are administered to gain a comfortable level of sedation. Regardless, no treatment is initiated until the patient is comfortably sedated. 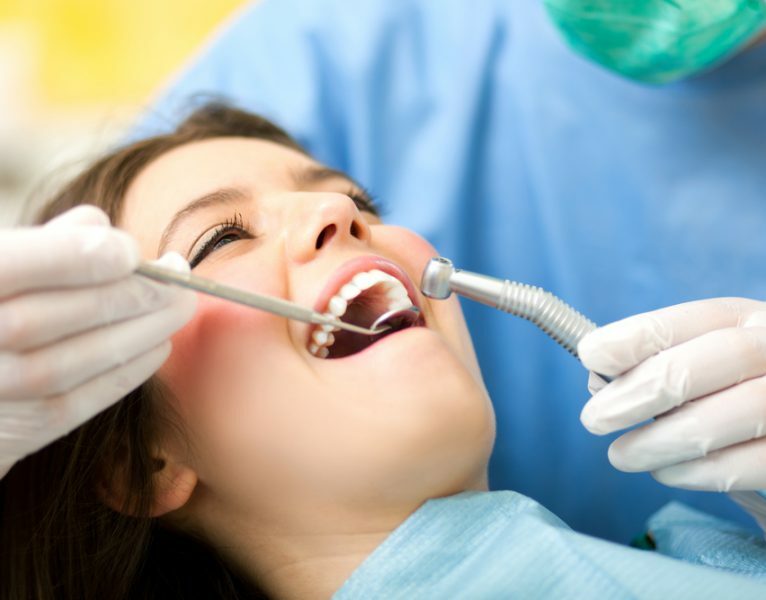 What is conscious sedation (moderate sedation) for dental work? Conscious or moderate sedation dentistry, which is also referred to as analgesia or procedural sedation, is the process in which sedatives are given to a patient before a dental procedure to help them relax. These drugs, such as Valium, Ativan, Triazolam, and Vistaril, are normally given to dental patients who have a general fear of dentists or have anxiety when needles or other sharp instruments are being used. Conscious sedation drugs can also be administered intravenously. Common drugs used in intravenous conscious sedation are: Versed and Fentanyl. Conscious sedation allows the patient to become comfortable and many times sleep before the dental procedure begins so they can relax. It also helps reduce the amount of pain the patient may experience from the dental procedure they are undergoing. Another form of conscious sedation includes inhalation sedation. An example of inhalation sedation would be when a patient is given nitrous oxide (laughing gas). So which of these forms of sedation should you use? The treating dentist will be able to help you make that decision. There are many factors to consider such as your age, heath, previous drug history, level of anxiety, and the dental procedures being performed. The bottom line is, dentistry is much more comfortable with the use of dental sedation. Yes. Sedation dentistry is a safe, efficient, effective method for many patients to receive dental treatment. It is actually safer than not receiving sedation since dental fear and stress could provoke a dental or medical emergency. Prior to starting sedation dentistry, Dr. Hank will work closely with you to determine the best sedation option for your treatment. As an expert in Dental Anesthesiology, Dr. Hank will safely and precisely provide sedation dentistry when it is the best option for a patient's comfort and care.